Lose yourself to the elegant mischief of By Terry Terryfic Oud, a dancing and sensuous fragrance collection with an arabesque of warm notes. 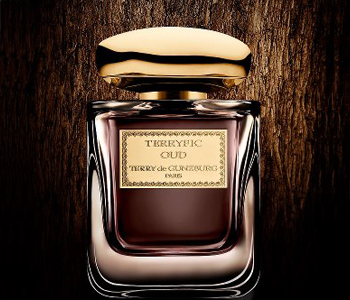 The Terryific Oud collection brings a sombre, intriguing presence with its labyrinthine perfumes. Celebrating the resinous oud note, highly prized for centuries in perfume, each captivating fragrance brings together exceptional raw materials. Couture scents that add a new twist to an ancient ingredient. A voluptuous chapter in Terry de Gunzburg’s world of Haute Parfumerie.